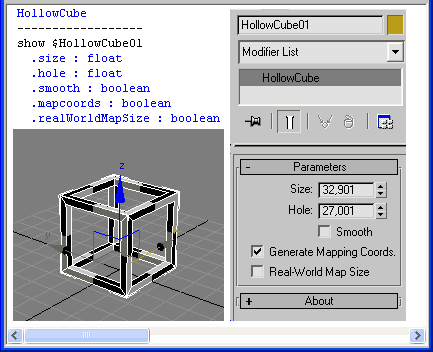 HollowCube is a simpleObject scripted plug-in. Procedural primitive that I made today for fun. At ScriptSpot already exist another plugs called HollowCube. Martin Breidt HollowCube has different purpose-built. My version is a lightly different, it's a cube with 2 params "size" and "hole" which can be set to equally value for "invisible" effect in animation. As well I use a simple build mesh procedure what is more faster, but not done well with meshsmooth. IF someone decide to install both plugs then MUST to rename one of them to HollowCube2 or something else.